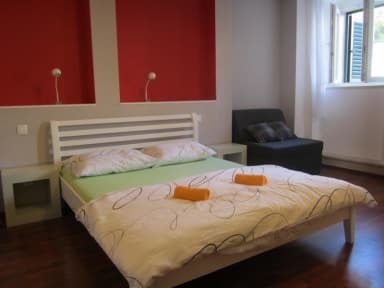 Apinelo Hostel is a new hostel located in the town centre close to all major things you might need. All our facilities have been recently renovated. We offer free wi-fi and computers with broadband internet access. Apinelo Hostel features a private apartments and rooms with private bathrooms. Every room and apartment are air conditioned. The beds are pre-made and come with free linen and towel. Self service kitchen is also available..
We also offer free wi-fi and internet access so you can stay in touch with the rest of the world. Our friendly, welcoming and English speaking staff can help you with maps and give you essential tips. Apartments and rooms are located on the ground floor. Deluxe double/twin rooms are located on the first floor. DELUXE DOUBLE STUDIO APARTMENT IS LOCATED 1 MINUTE walking distance from the reception.Studio apartment has large double bed and private bathroom. Studio apartment is equipped with kitchen ,AC, huge closet ,PC with large screen cable LED TV and disco ball for special moments. Pre-made comfortable double wooden bed with linen and towels.Located on the ground floor. DELUXE TRIPLE STUDIO APARTMENT IS LOCATED 1 MINUTE walking distance from the reception.Studio apartment has large double bed and chair sofa bed. Studio apartment is equipped with private bathroom ,kitchen ,AC, huge closet ,PC with large screen cable LED TV and disco ball for special moments. Pre-made comfortable double wooden bed and chair sofa bed with linen and towels.Located on the ground floor. SUPERIOR DOUBLE ROOM IS LOCATED 1 MINUTE walking distance from the reception. Room has large double bed with private bathroom. Double room is equipped with AC, closet ,PC with large screen cable LED TV and disco ball for special moments. Pre-made comfortable double wooden bed with linen and towels.Located on the ground floor.Located on the ground floor. STANDARD DOUBLE ROOMS ARE LOCATED 5 MINUTES walking distance from the hostel reception and 3 minutes from the city center.Double room is equipped with large double bed, private bathroom ,AC, closet ,PC with large screen cable LED TV and disco ball for special moments. Pre-made comfortable double wooden bed with linen and towels. There is also a kitchen at this property shared between three rooms.Located on the ground floor. DELUXE DOUBLE AND TWIN ROOMS ARE LOCATED at our new reception.Deluxe rooms are equipped with king size bed or twin beds ,private bathroom,AC,closet, large screen smart LED TV and disco ball.There is NO kitchen at this property.Located on the first floor. Reception hours are from 9 am to 10 pm. The hostel has to be contacted at least 24 hours prior to arrival if arriving before or after Reception Hours! Ottimo ostello c'è quasi tutto quello che serve.. a parte il parcheggio che se si ha un auto bisogna andarselo a cercare. Nella speranza di trovarlo! Presenza di cucina, Wi-Fi, bagni e docce con acqua calda, arredamento praticamente nuovo.. Personale gentile e disponibile! Vicino al centro storico! Very nice hostel in the centre of Split...The accommodation was really beautiful and you can find all the privacy and services you need. The room was really well furnished and clean. I recommend especially the private rooms, they are separated from the main building but in this way you have more privacy. It has, in my opinion even higher standards than a 3 stars hotel. Molto gentile e disponibile la ragazza della reception. Possibilità di lasciare i bagagli in deposito chiuso a chiave in attesa di fare il check-in. Bisogna tenere conto di dover poi trasportare i bagagli per 5-10 minuti a piedi se si è prenotata una stanza con bagno privato, perchè non si trova nello stesso stabile della reception. La stanza è in una casa di una stradina del centro storico (molto vicina al palazzo di Diocleziano), che consta di tre camere e di un cucinino ad uso degli ospiti.